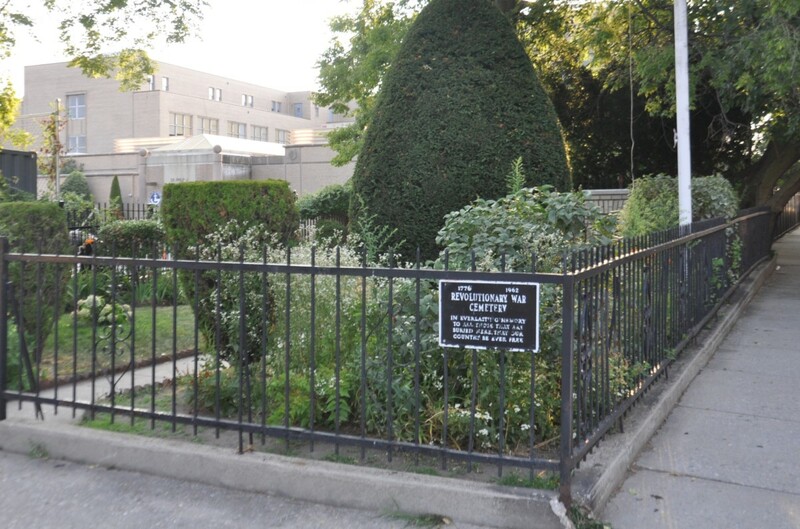 One of the oldest existing burial grounds not only in Brooklyn but also on Long Island exists in Bay Ridge, occupying a small plot on the southwest corner of Narrows Avenue and Mackay Place. The latter is named for John W. Mackay, who in 1868 bought most of the land between 69th and 71st streets, Shore and Colonial roads. (He and his wife then sold a chunk of it in 1892, including around the cemetery plot, and he died in 1905. His granddaughter married Irving Berlin!) The land’s earliest European owner was the Barkaloo family, after whom the little graveyard is named. Like many other prominent, old, likely slave-owning Dutch families in the area, the Barkaloos (variations include Barkeloo, Barkelu) had a private family burial plot on their own property, but this one survived into the present-day through a combination of luck and community organizing. 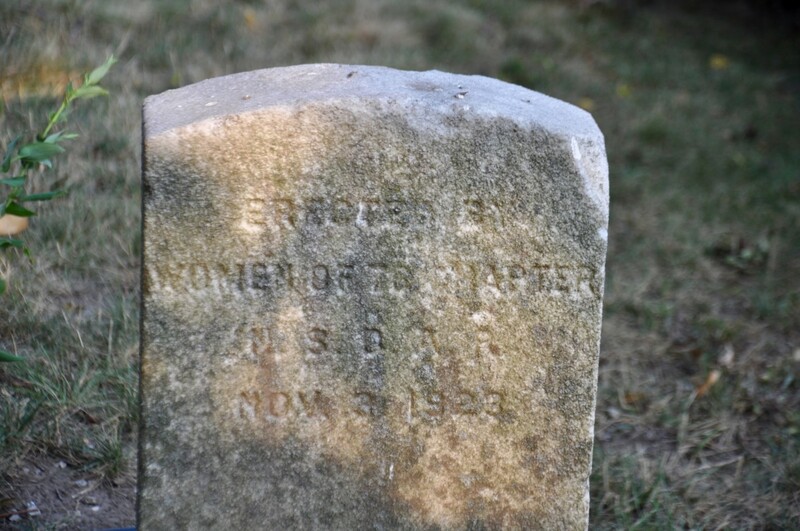 According to a stone in the Barkaloo cemetery, placed in 1984 by the Bay Ridge Historical Society in conjunction with Barkaloo heirs, 21 people in total were buried here since the 1720s, up until an unnamed infant died in 1848. That granite marker was the result of research that upended previous knowledge. 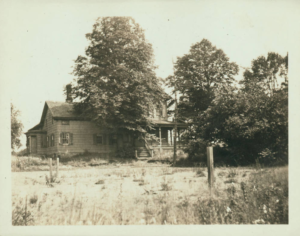 According to William Applebie Eadeley’s 1916 typewritten survey, Cemeteries in Kings and Queens Counties, Long Island, New York, 1753–1913, for example, the earliest burial in the Barkaloo plot was thought to be in 1788 (Catherine Suydam, first wife of Jacques Barkaloo), although by 1916 one burial stone was too worn to read, and several had already been stolen. Eadeley thought the last burial was Maria Barkeloo, Jaques’s second wife and widow, who had remarried Simon Cortelyou, a widower who would become the little plot’s most famous resident; Eadeley didn’t know about the infant, likely a great-grandchild of Maria. He knew so little because he’d found just three grave stones “in the tall brush.” Research led him to just nine more interments. Though the graveyard had been closely held by the family for more than a century, the land surrounding it finally passed into other hands in 1834, when Maria Cortelyou, who would eight years later be the last adult buried there, sold 36 acres to Charles R. and Lantham Cornell, for $7,000. The deed, however, includes the following language: “Excepting the Grave Yard upon said farm as now in fence which is reserved to the said Maria Cortelyou in fee.” Similar language about such a graveyard reappears in the 1868 deed to the Mackays (from Elizabeth P. Child, an heir of Charles Prince, who’d bought it from the Cornells). 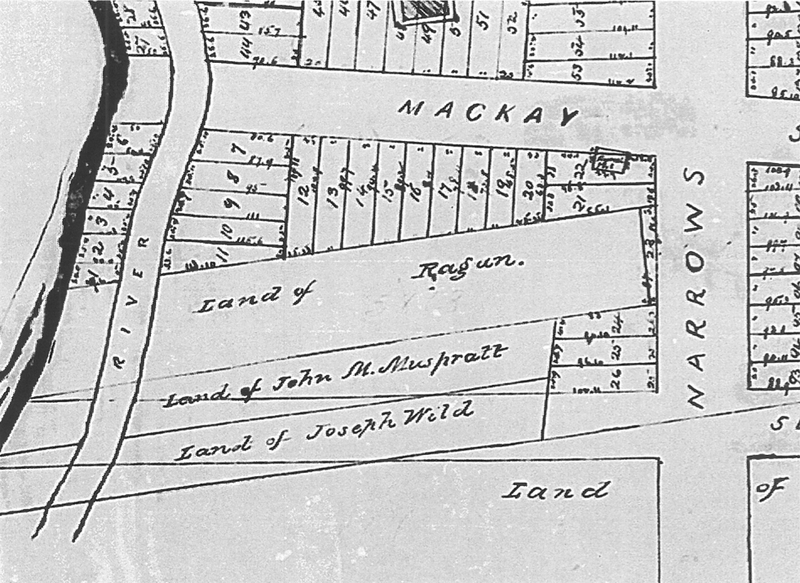 A survey of John Mackay’s land from 1875, just seven years later, shows a “burial plot” just west of Narrows Avenue, extending northward into what’s now Mackay Place. It was a small square plot, a fraction of the size of the present Barkaloo site, a small piece of just one developable lot. 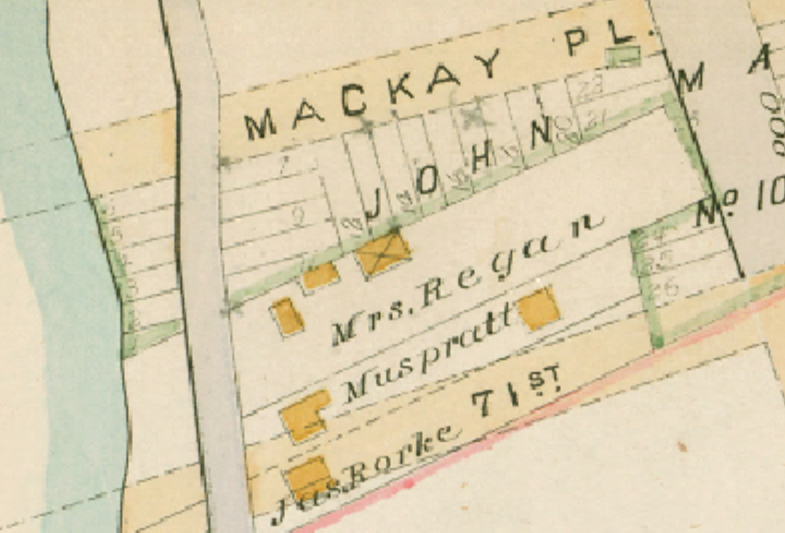 The lot within which the graveyard was contained was sold by the Mackays, with some other land, in June 1892, to Edward Freel, a wealthy contractor. The deed includes many restrictions, including permitting only one- or two-family houses to be built on the lots fronting Mackay Place, but makes no mention of the burial plot. It seems impossible to say what had happened to the graveyard in the intervening decades. Perhaps the descendants of Maria Bogart Barkaloo Cortelyou moved away and stopped caring for or about this old family plot. So maybe Mackay gave up on it, too. Ancient little cemeteries could be seen by developers around this time not as darling bits of history worth preserving but as nuisances in the way of progress. Many old Dutch families in the area would have had similar graveyards that have all since been lost to time and history; the same goes for little church graveyards, such as the Episcopal cemetery at Sixth Avenue and Couwenhoven Lane, in what’s now Leif Ericson Park, which was dug up and moved in 1901. Barakloo Cemetery seems to have been forgotten, going to seed as the 19th century became the 20th, and a newspaper account describes the process, as avaricious locals took advantage of the neglect. “For a century the little plot held its own,” the Eagle reported in 1923 (though we know now it was likely for longer). In its original several acres were buried the pioneers of the great community in which it is now only a dot. But, as the years went by…it grew smaller. By dead of night sometimes, sometimes by noonday’s glare, laborers came and emptied the graves of their ashes and then closed in the plot by making its circumferential fence a bit smaller. Finally only four tombstones remained and inside a fence that circumscribed a plot just 27 by 20 by 15 feet. And then the refuse man came and dumped his ashes and these headstones, too, vanished. Strange tales there are and whispered stories regarding the despoilation of the little cemetery. Some say men were paid to carry away the stones at night; others shake their heads over the fate of the burying ground of one of the proud and noble families of old New Utrecht. The oldest inhabitants recall distinctly that fifty years ago the cemetery covered about the space of a city block and contained more than thirty graves. It was surrounded by a high picket fence which was given a fresh coat of white paint annually. It is said that all the branches of the large family contributed yearly to a fund for the upkeep of the family cemetery. “They say” that finally the fence began the habit of creeping. The cemetery got smaller and smaller and then bit by bit the fence disappeared altogether. It was gathered up for firewood by those who found that it was less expensive to go after fuel at night than to make a daytime call on a fuel dealer. The Eagle expanded later in the 20th century on this sorry state. 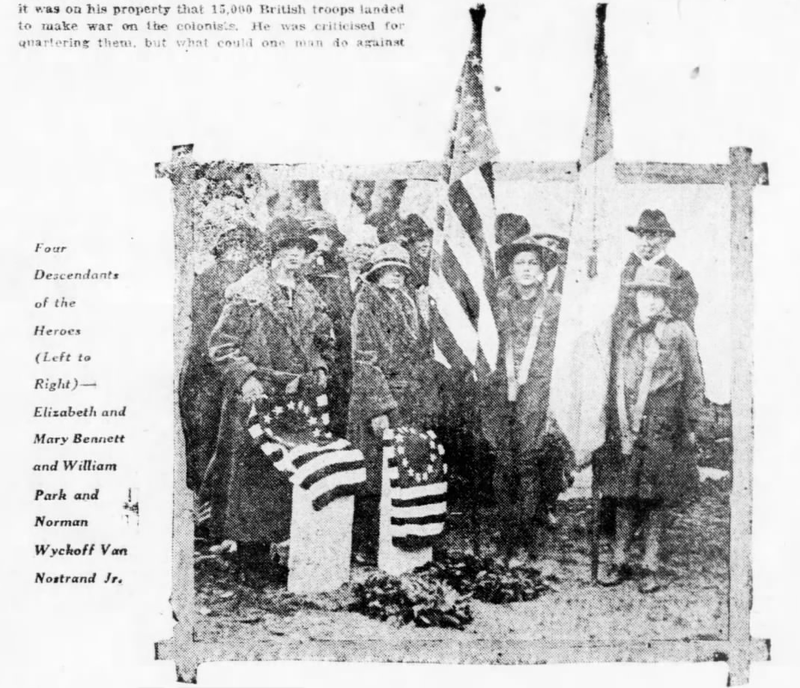 Squatters, who had made homesteads in [the Shore Road] section many years ago, had violated the patriotic nook to the extent of digging up gravestones for their doorsteps and mantelpieces, according to some old Bay Ridge residents. Whether this is actually true is a matter for dispute, but…some people claim to have seen stones reputed to have come from Barkeloo Cemetery gracing the doorsteps of squatters’ shacks, which have since given way to new and attractive homes near the bay. Bangs describes the graveyard around the same time as Eadeley visited, ca. World War I. It is a sadly neglected, rubbish-covered little spot…where some forty members of this family were years ago buried. [Her neighborhood lore may be exaggerated.] A few stones still stand, one being for Jaques Barkeloo, the man who, in 1794, advertised for a school teacher, capable of teaching reading, writing and arithmetic in English. This was the introduction of the English language in the little school in New Utrecht village. There are no local Barkeloos left now, and no one cares for the hallowed spot where sleep Harmanus [Barkaloo] and Jaques. [I] could only reverently copy the scene and here pay tribute to their memories. 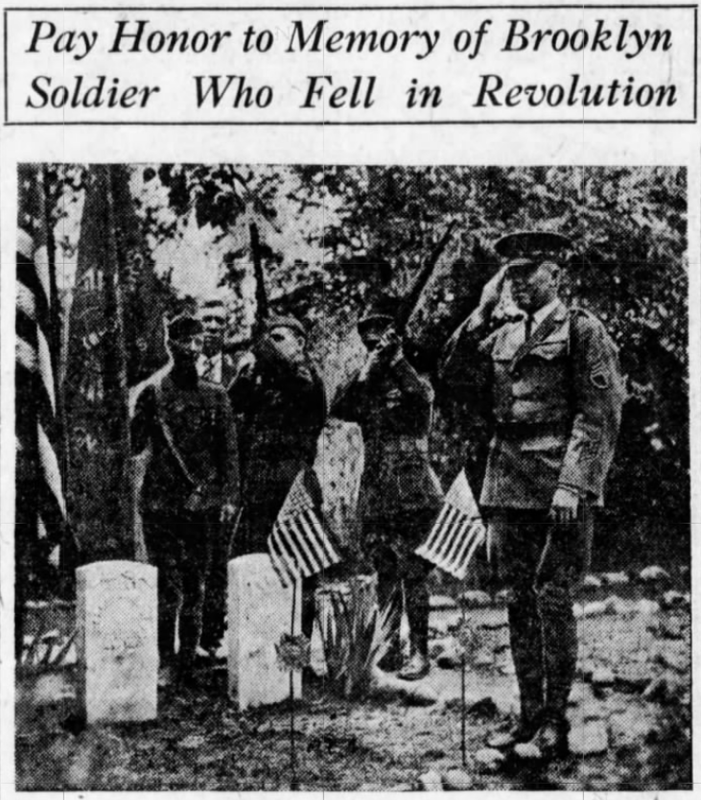 …And in this cemetery also sleeps the patriot soldier, Harmanus Barkeloo, whose Revolutionary services are claimed by [the Cropsey family]. Surely this hallowed spot merits a reverent care the writer cannot give, yet would rejoice to see bestowed by a united family composed of local “Sons” and “Daughters” of the Revolution. It was, eventually, the Daughters of the American Revolution who would reclaim this spot—and radically alter it as well. 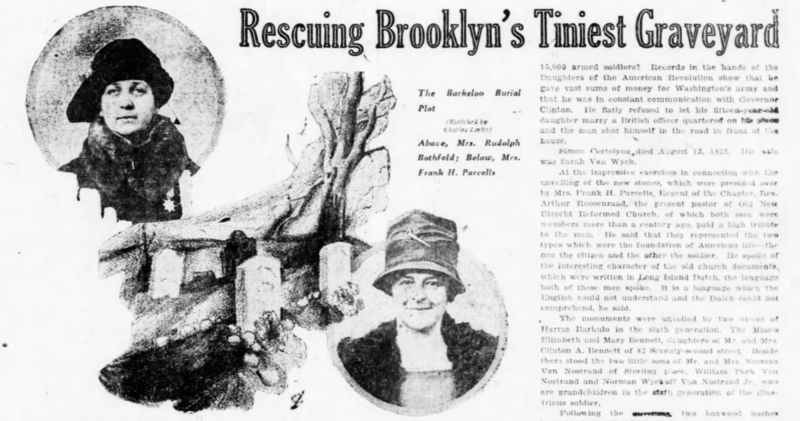 First, a campaign was launched by a local paper, Home Talk, in 1923; unfortunately, the Brooklyn Public Library’s Brooklyn Collection has a gap in its Home Talk archives, including the year 1923. But the campaign is alluded to in the Eagle, which reports the Women of ’76 Chapter took up the cause, under its regent, Mrs. Frank H. Parcelis. At the time, the subway had been going to 86th Street for several years already, and would soon open to 95th Street. A building boom had been raging in Bay Ridge for decades, and it was surely do-or-die time for the little cemetery. The DAR sold the restoration to the community by branding the graveyard “The Revolutionary War Cemetery,” after Lieutenant Harms Barkaloo, who’d fought in General Washington’s army in the Battle of Long Island, as well as Simon Cortelyou. “Records in the hands of the Daughters of the American Revolution show that [Cortelyou] gave vast sums of money for Washington’s army and that he was in constant communication with Governor [George] Clinton [an ardent revolutionary remembered as “The Father of New York State,” who served Thomas Jefferson and James Madison as Vice President],” the Eagle reports. However, I’ve never seen such evidence, and much evidence, easily accessible, exists to the contrary—that Cortelyou and his family were Tories, loyal to the British—including that rebels kidnapped him and exchanged him to the British for two prisoners, ransacking his home of valuables while he was in captivity. Bangs, not particularly political, notes in her book that all three Cortelyou brothers were indicted as Tories, according to records in Albany; she treats the Cortelyous’ politics as well-known and -accepted, controversial only to surviving descendants, whose best, most plausible-seeming argument was that the family had in fact stayed neutral. The DAR seems almost certainly to have fudged the facts, possibly to save the cemetery. Maybe, sometimes, you have to blur history in story in order to preserve it in place. Similarly, the DAR does not seem to have preserved the cemetery in the space in which it appears on 1875 and 1890 maps. (It does not appear at all on subsequent maps, such as this one from 1893 or this one from 1905.) Rather, the group took the closest developable lot of land, as existed on modern surveying maps, and incorporated the newly refurbished graveyard within its borders—apparently re-creating a graveyard in the closest available space. 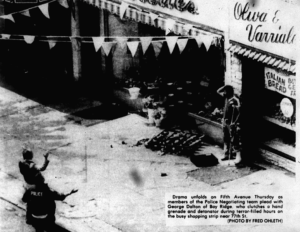 It’s unclear if any bodies needed to be or were dug up and moved, or whether bodies are still buried under the Mackay Place sidewalk. But soon real estate deals would require the graveyard to have firmer boundaries. The present-day Xaverian High School lot, from 71st Street to Mackay Place, Shore Road to Narrows Avenue, had gone largely undeveloped in the years after the DAR’s reclamation of the cemetery, home to just a few houses, on Shore Road (including that of Victoria Muspratt, who was murdered there in 1934) and a few along 71st Street, near the corner of Narrows Avenue. 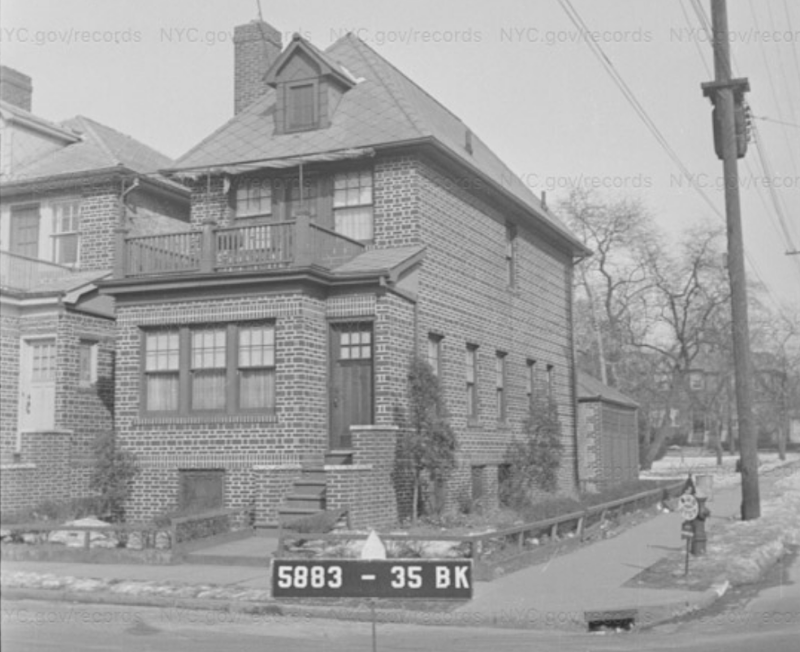 In the 1930s, the city was looking for a large piece of real estate on which to build a new high school, to complement the Bay Ridge High School on Senator and Fourth (now Telecommunications), and the lot was one under consideration, along with another on Shore Road at 100th Street; the old Crescent Club site, on Shore Road and 83rd Street; and others. One letter writer to the Eagle argued in December 1937 that the “Mackay Place site” was ideal. “[It] offers accessibility, because of its central location and its transportation facilities,” he or she wrote. It offers ease of acquisition, because there are no legal or physical restrictions [unlike the strict zoning around the Crescent Club site]. It provides economy of purchase because there are no expensive buildings to be condemned [unlike the 100th Street site, which already had apartment buildings on it] and because the 200,000 square feet it incorporates are ample for school purposes. Because of its frontage on the bay and its proximity to Owl’s Head Park, the site offers additional recreation space for students. City leaders disagreed, however, and ultimately chose the Crescent Club site. The cornerstone of Fort Hamilton High School was laid by Mayor Fiorello LaGuardia in 1940, and it opened its doors to students in September 1941. The little cemetery occupies about 15 square feet of one corner of a great piece of open land that runs from Narrows Ave. to Shore Road. …Last summer I made a trip to Barkaloo Cemetery and I found it in a shocking state of neglect…In the first place, it is set off by a mangy hedge. There is no protection whatever for the headstones. Some are kicked down, some broken off at the base. The earth is bleak and refuse-littered and I saw empty beer cans and broken glass strewn around…. [The] resting place is a free-for-all for frolicking kids crashing through the hedge and a catchall for empty beer cans. 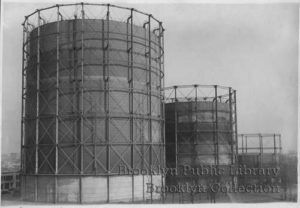 A real estate company associated with the Catholic Church had purchased the land back in 1947 and transferred it to the Brooklyn Diocese in 1948, according to public records. A few years later, the Brothers of St. Francis Xavier, or the “Xaverian Brothers,” responsible for Catholic schools around the borough and country, decided to build their latest private high school there. Xaverian High School was founded in 1955, according to its seal, and the Diocese transferred use of the land to it in 1956. 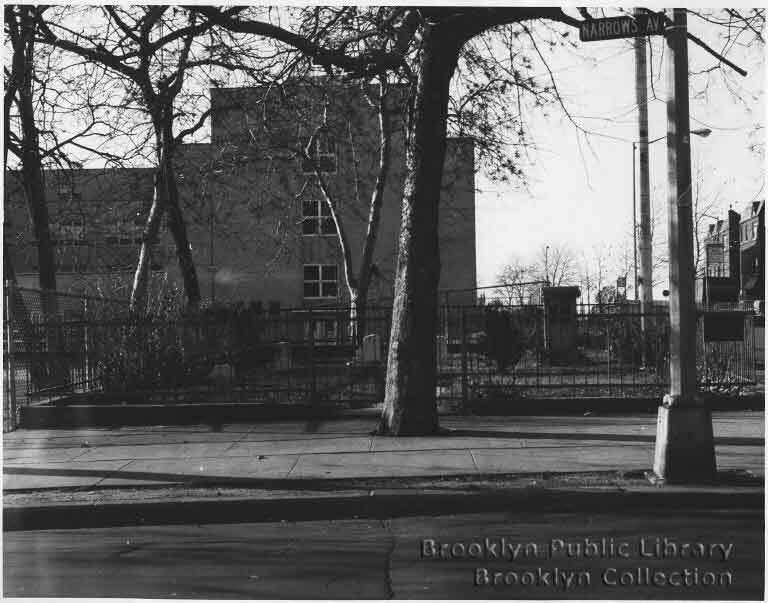 The school opened to its first 560 students in September 1957—twenty years after that letter to the Brooklyn Eagle. 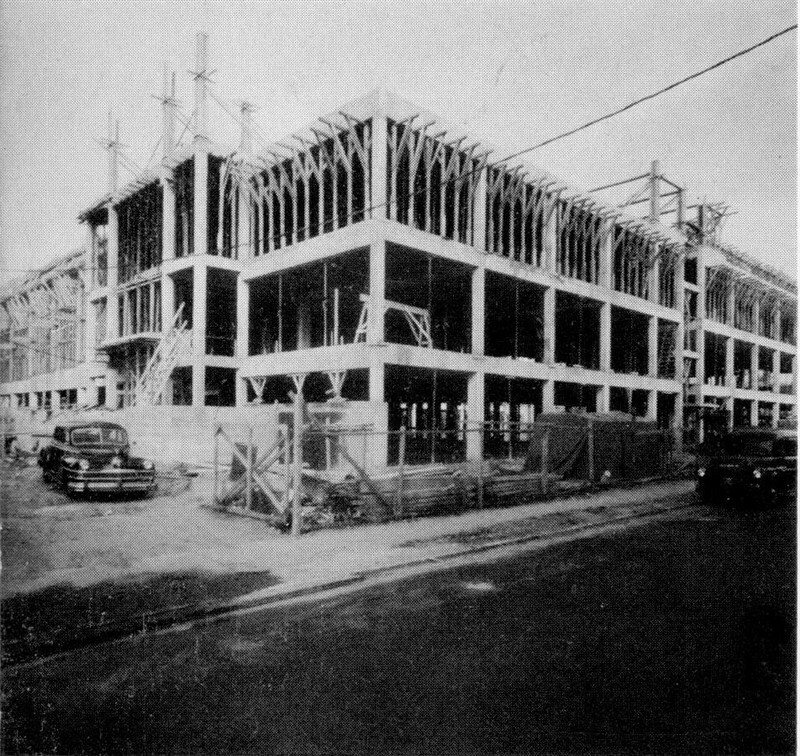 Xaverian High School under construction, ca. 1956. It’s likely that the legal questions about cemetery ownership that persist in the deeds go back to Maria Cortelyou’s retention of the graveyard when she sold the surrounding property in 1834. Her will makes no mention of the graveyard, but it leaves her property in trust, with instructions for it to go to her daughter, then upon the daughter’s death to all the grandchildren. If they’d sold the graveyard at some point, there’d likely be a record on file with the city, where we’ve turned up none. The 12:30 Club said it would confer with the head of the DAR to see what they could do, but it seems that nothing significant came from this (except the formation of what appears to have been the area’s first historical society). The city didn’t take possession of Barkaloo Cemetery. The situation has only gotten blurrier in modern times. On paper, the cemetery doesn’t even exist anymore. It’s not on the most recent tax maps, which indicate every property lot in the city. You can see where it was on the previous tax map, from 1963—but it appears to have been literally erased. In 2016, the Diocese filed a “Correction Deed” with the department of finance; whereas the Diocese’s original 1948 deed carved out an exception for the cemetery plot, the new one makes no such exception, granting the diocese ownership of the entire block, from 71st Street to Mackay Place, Shore Road to Narrows Avenue. This was before Xaverian secured several million dollars in mortgages, not long after the school decided to become co-ed to help with struggling enrollment and finances. It’s likely that to help secure the mortgages, the school wanted to clear up any ambiguities on paper about the property and its ownership—essentially asserting that there were none, though there clearly are and have been for much more than a century. 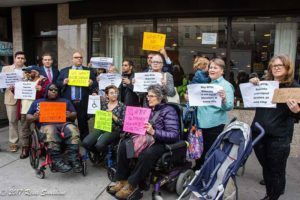 If the diocese were to try to sell the cemetery, Barkaloo–Cortelyou descendants could challenge its claim to ownership. But, even if they could be found and were interested in doing so, there’s no guarantee that a judge would find in their favor. It’s important to establish secure public ownership of this site before such a hypothetical emergency arises. Barkaloo Cemetery has persisted in this community for almost 300 years while the neighborhood around it transformed in ways that would have been unimaginable to the earliest settlers. It’s a link to our history that belongs by right to every Bay Ridge resident—and ought to be protected now by law. A huge thanks to James Whooley, Bay Ridge resident and title examiner, for digging up the old deeds, surveys and wills.